I present to you the Morvarg. Supernatural wolves of the spirit world: they patrol its shadowy borders, hunting down anything that tries to make it back to the land of the living. They may also act as guards and/or guides to select souls passing through to the afterworlds, which the spirit world is the gateway to. Occasionally they come to the mortal plane to drag away unfortunates whose time is deemed to have come and those who attempt to cheat death. 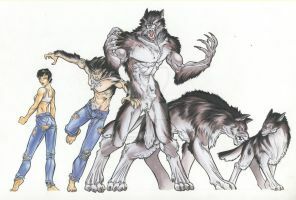 Their bite causes lycanthropy so anyone bitten by one and not dragged off to their realm is doomed to die and rise again as a dire (undead) werewolf. The Morvarg are not truly undead themselves as they were never alive in the first place. Generally they appear at first glance as large, black wolves with glowing green or red eyes, sometimes with a glowing aura like flames that never burn their host. Very occasionally one may be white. This appearance can change, with their skeleton seeming to show through as a pattern in their fur and, if really riled up, any resemblance to a living creature will vanish and what remains will be a very angry skeleton surrounded by smoke, burning inside with in inner balefire light that sears the soul. They are almost always accompanied by unnatural crows which are an extension of their being, scouting afar for them. Can I use this as a profile picture for a game called WolfPlay? This image gives me the warm fuzzies... I love it. Delighted someone besides me gets that here. Thank you! i love your awesome style! I really liked the concept of the Morvag! very interesting, love how these wolves looks so brutal! ohh that will be awesome man! Thank you! I had fun with this.